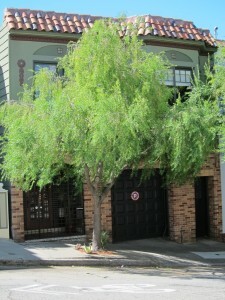 Here is a beautiful tree on Piedmont St, near Asbury, in San Francisco. This American Sweetgum is technically a deciduous tree, but here in our Mediterranean climate they don’t normally lose all of their leaves at once. They look a lot like Maple trees. Some of them have better fall color than others. We needed to prune this tree for clearances and to reduce the weigh on the ends of the branches to reduce the risk of a branch breaking and causing damage. The goal was to make the tree look as natural as possible. 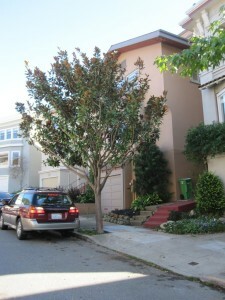 I don’t know who pruned this tree, but it looks terrible. 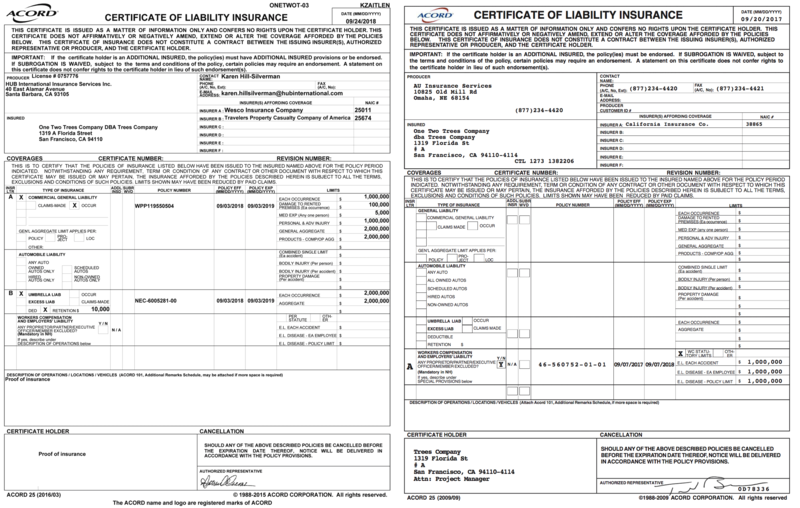 Is it really worth saving a couple of hundred dollars for this? 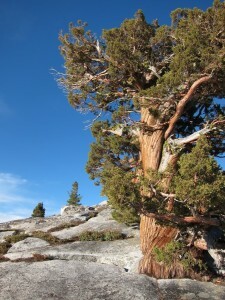 Check out this Juniper growing out of a granite boulder at Yosemite National Park. Thousands of years of evolution has enabled this species to grow in this environment, high on a mountain, perched on a granite boulder. It wouldn’t survive anywhere but here. California coast Redwoods need moist, temperate air, humos rich soil. They naturally grow in valleys. They don’t like wind. Yet, people love them and want to plant them in windy San Francisco and in the dry central valley. So they look okay for ten, twenty years. But they they turn brown. And they call me. And I have to tell them it probably shouldn’t have been planted in the first place. Sycamores are riparian trees, but require a drier climate. They hate wind. Yet we continue to plant them all over San Francisco. Why? Who knows? They look terrible in Civic Center; thin, barely any foliage, leaning away from the wind. They keep planting them on Valencia. It’s too bad. Jacarandas, from Brazil, need lots and lots of sun. They look great in Mexico City. Flying in to the city in March, the ground is blanketed in purple. 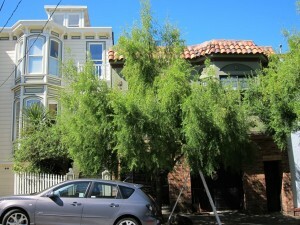 In San Francisco they generally look sick. Some years are better than others. Sometimes they bloom well, sometimes not. This is not a tree I would plant here. So before you choose a tree for your desired location, consider your soil type, the wind, water availability, and sun exposure. Sometimes the recipe for a successful planting can come down to being on the sunny side of the street or away from a wind tunnel. 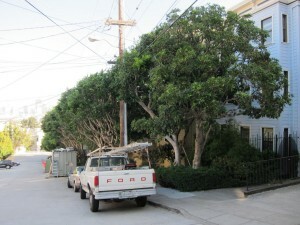 These big Ficus Trees on Carolina and 19th Street in San Francisco were getting too close to the high voltage power lines. 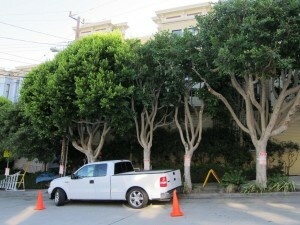 It took 5 of us 4 days to prune all these trees. 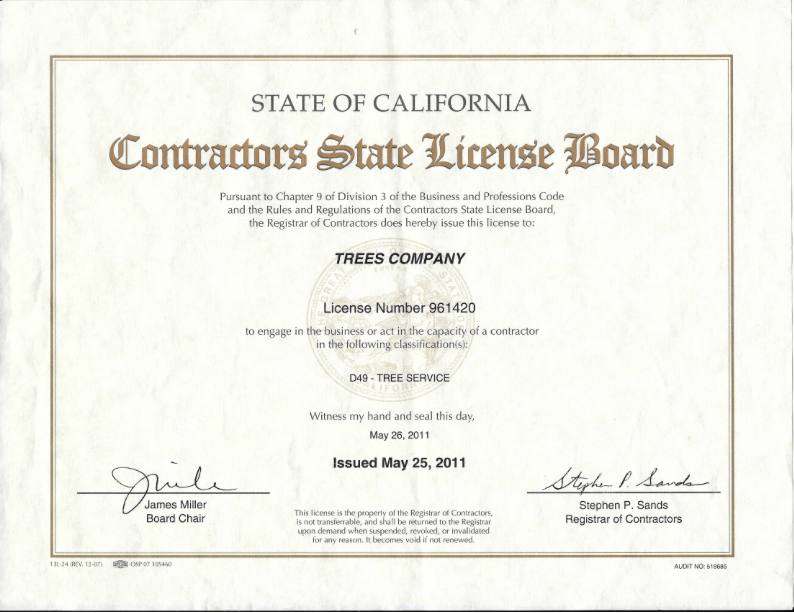 The goal was three fold: First we wanted to keep PG&E out of the picture. PG&E tends to do a really bad job pruning trees. They are certainly cheaper, but you get what you pay for. 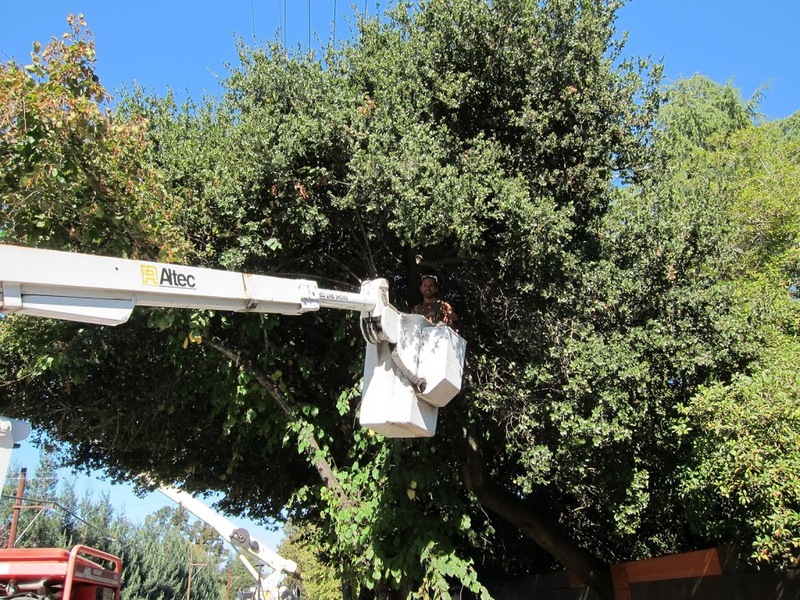 Secondly, we needed to create a 14 foot clearance over the street to comply with the city regulations and to keep trucks from damaging the trees. 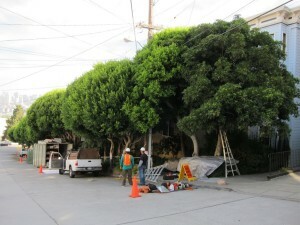 Finally, the clients wanted to let more light onto the sidewalk. Sometimes a dense canopy can lead to mischievous behavior at night. The neighbors wanted to feel safer. Below is a BEFORE picture. About a month ago I sprained my ankle. It was inconvenient, but I was still able to work from this bucket truck. It’s a wheel chair for arborists. 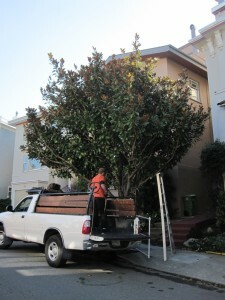 I wouldn’t recommend this for fine pruning, but for street clearances I was able to get the job done in record time. The electric company provided the truck. It was fun. But I had spiders in my bucket, eek! 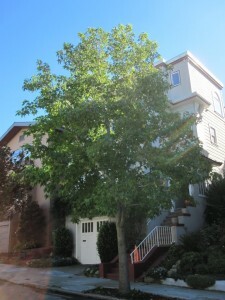 The Mayten Tree is a beautiful tree from Chile. It has a gorgeous pendulous branching that looks like a waterfall. BEWARE!!! 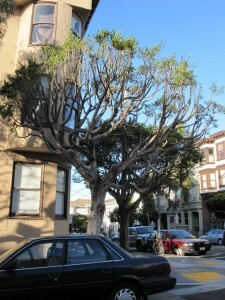 Although this tree looks spectacular it has the most aggressive suckering roots that I have ever come across in San Francisco. If you plant it in your garden you will have suckers popping up all over the place, possibly in your basement. 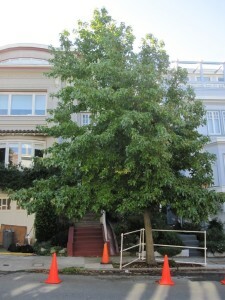 Also, if you prune this tree too aggressively it will sprout back even more aggressively. So prune lightly; make fewer, larger cuts. Be prepared to have to prune often to keep the desired shape. 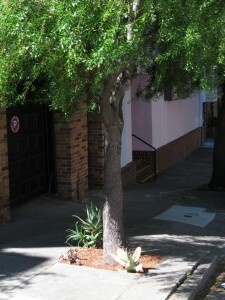 Pictured below is a street tree that I pruned in the Castro Dist. As you can see it looks a bit unkempt. I cleaned it up and also planted some succulents in the tree well.